Yesterday when I returned from doing volunteer Math Goals testing for my son's 4th grade class my husband handed me a package that had arrived while I was out. See 'when you do good you get good'! My Mum is right on that one. The package was from Kristy in Qld. The moment I touched the package (before I even shook it or squeezed it) I knew what was inside. 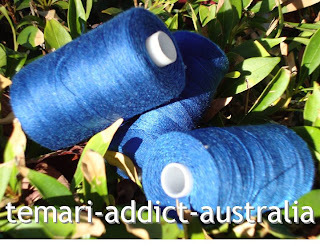 There were three spools of surface wrap thread that I had admired on the beautiful ball she'd sent to me at Christmas. What a darling you are Kristy! 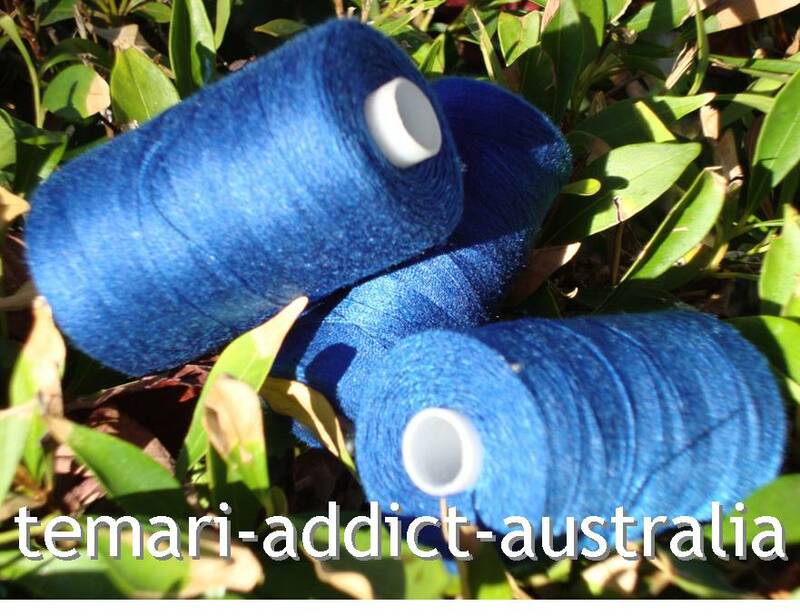 Thank you so much for thinking of me and taking the time to post me some of this gorgeous thread. I love it! 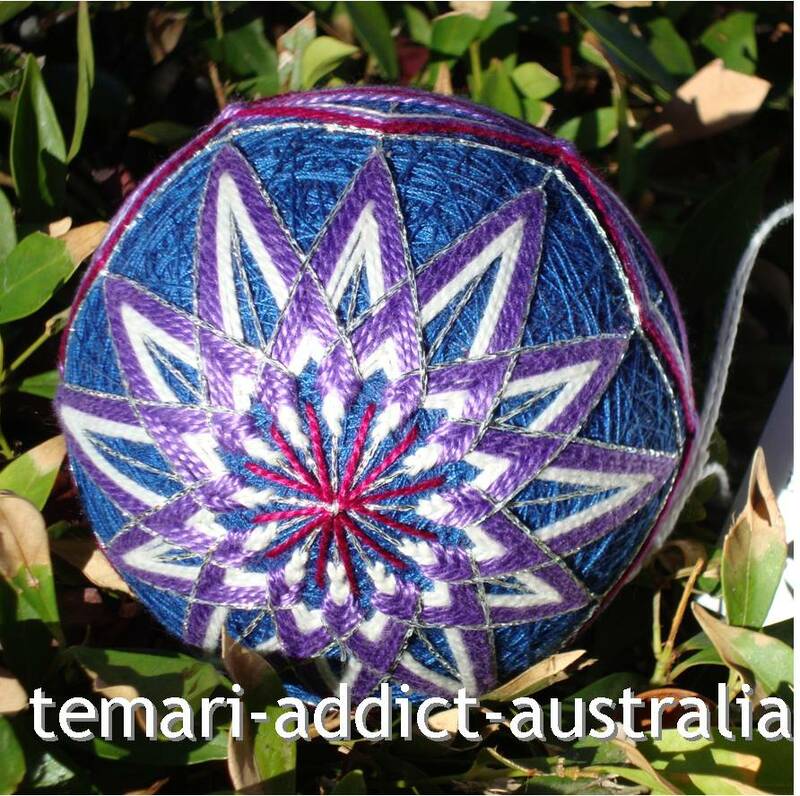 My hands were already aching because I had re-made three temari in the last 36 hours (two C10s and a S12 and I still have a couple to go), and although I should have had a rest tonight I found a yarn wrapped temari and I couldn't resist covering it in this beautiful coloured thread. The of course I wanted to stitch it, something simple, but I wasn't sure what. I reviewed all my old temari in boxes recently before donating a bunch of them to my son's school, and one part of a pattern stuck in my mind. The green layer from the Mema is a Star ball that I purchased form Barb Suess a couple of years ago. So I decided to try to work out the green layer from the ball (which is always displayed in my lounge room). When I was done with that part of the pattern I added some 6 point star bursts (Matsuba) to fill in the open areas. 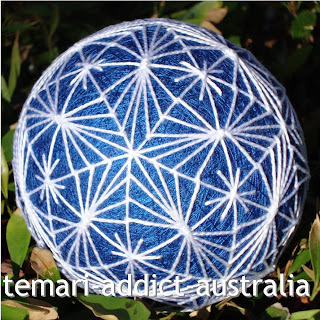 When I finished my temari I sat back and thought gee that is pretty neat, and an original design too. Well yes and no, it is original in the sense that I altered a design and added my own embellishments but actually I realised that there was a ball pattern out there that is strikingly similar. I got Barb's blog update about her Echo Star class beginning tomorrow and took a visit over to her Esty site. I discovered that Barb beat me to it and she sells the pattern on Esty but when I compare the images side by side they are actually different. Just goes to show you can't claim something as an original design too easily in temari making. Nicely done. I love the extra touches.